Fall is an incredible time of year. The leaves change color, the air is crisp, and we get to pull out our favorite sweaters from the back of the closet. Also, we get to enjoy the produce that helps keep us warm as it cools down. 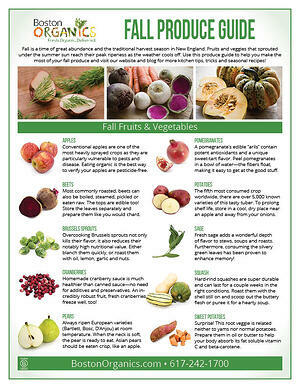 Check out our fall produce guide to learn a bit more about what's to come from Boston Organics this season. Our seasonal produce guides are a wealth of information including tips and recipes on how to best use the fruits and veggies in your box. You’ll also meet some growers of the crops harvesting this season and get a couple of recipe suggestions that highlight the splendid tastes of fall. Click the image to download the guide. Your favorite seasonal produce add-ons are available for a limited time. Order them now!